Will Personal Debt Push Consumers Over the Fiscal Cliff? Consumers continue to face a lot of financial uncertainty. While the balance of power in Washington looks similar to how it appeared before the election, the big battle over the country’s growing debt load—$16 trillion and continuing to swell—is still raging. How will the government avoid the so-called “fiscal cliff”—the $600 billion of tax increases and spending cuts that are scheduled to take effect in 2013? And what does it all mean for consumers, especially those carrying heavy debt loads? “Your best protection against the impending fiscal cliff is to begin eliminating debt now,” says financial literacy expert and founder of the DebtFree Academy, Anthony Manganiello. Know where you sit financially with your personal cash flow, NOT to be confused with a budget. Determine what smaller balances on debt you can pay off NOW, so you can free up monthly payments tied to those balances. You may need that cash flow in the not too distant future. Focus on complete debt elimination. Concentrate all available funds towards eliminating as much debt—as quickly as possible—so your cash flow is in as good a shape as possible should the White House and Congress fail to take action. Learn from the past. Look at your monthly cash flow and ask yourself, “What did I buy that resulted in all of these payments?” If you can’t answer that question with any degree of detail—meaning you’ve spent money on purchases you really didn’t need—let that reality sink in and avoid making the same mistakes in the future. Realize that you’re a wealth generator, but not necessarily a wealth accumulator. Think about the past five or 10 years: How much income did you bring home and what do you have to show for it? Then, project what you will likely earn over the next five to 10 years and focus on accumulating as much of that wealth as possible. Add up all your debt payments (mortgage, cars, credit cards, all of it) and ask yourself: If I was completely debt-free and didn’t have to make these payments, how much better off would me and my family be?” Let that be your motivator. Determine how much of your gross annual salary is earmarked for debt payments. Depending on your income tax bracket, ascertain how much of gross income you have to generate in order to bring home enough to make your annual debt payments. Many households have more than 50 percent of their gross annual income earmarked towards servicing debt. Even if the fiscal cliff is avoided, what have you learned? While the administration may be able to curtail the fiscal cliff, and avoid going over the edge, what should this mean to you? 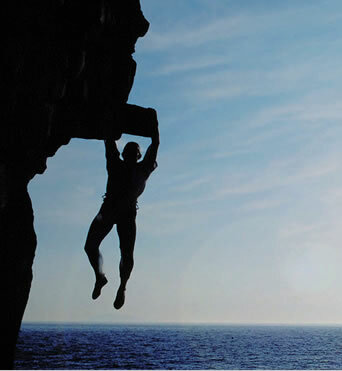 If the impending cliff had you in panic mode, then you need to reconsider your plan. It’s possible that—fiscal cliff or not—your greatest vulnerability is your personal debt load. If that’s the case, then you need to do everything you can to change that reality into achieving a financial position that has you as well prepared as possible in the event economic calamity strikes. Debt Elimination takes time. My wife and I have been at it for about 12 years, and except for about 2000 left to pay off a new car that we purchased in May 2012, we are effectively Debt Free. Over the past few years I have been focusing on paying smallest debt, then applying the extra on the next, etc. until all the payments were gone. It’s still a bit difficult because of the economy and takes constant vigilance, but we have proven that it can be done. Our mortgage was the last thing we paid off prior to buying the car, but have accelerated paying everything we could towards it. Now we are preparing for the first of the coming year when we hope to be in the wealth accumulation mode. It’s amazing how stress-free and clearer thinking one becomes when not burdened down by debt and paying as we go. We can still have many of the things we want, but we won’t go into debt for them. The imporant change has to happen between our ears. We have to change from a wealth-consumer mindset to a wealth-accumulator mindset. That change will help us resist the seductions constantly chasing after our money on TV, the internet, radio, billboards, mail, etc. Richard Cordray, director of the Consumer Financial Protection Bureau, says they were “wolves in sheep’s clothing”: purported “debt settlement” firms that sought out financially distressed consumers, often through misleading means, but made things worse for them rather than better. “While highly skilled young workers have traditionally provided a vital influx of new, affluent consumers to U.S. housing and auto markets, unprecedented student debt may damp their influence in today’s marketplace,” according to the post. Some Birmingham financial experts say consumers have a newfound zeal for cutting debt. According to a poll of over 1,000 consumers nationwide, 70 percent said they were planning to make a financial change this year. Sixty-seven percent of those surveyed said they wanted to reduce debt , more than 21 percent said they wanted to increase savings while only 2 percent said they wanted to pay off student loans. The least cited financial changes were to invest more money and to pay off a mortgage at .7 percent and .3 percent respectively. The first step toward taking control of your financial situation is to do a realistic assessment of how much money you take in and how much money you spend. Start by listing your income from all sources. Then, list your “fixed” expenses — those that are the same each month — like mortgage payments or rent, car payments, and insurance premiums. Next, list the expenses that vary — like groceries, entertainment, and clothing. Writing down all your expenses, even those that seem insignificant, is a helpful way to track your spending patterns, identify necessary expenses, and prioritize the rest. The goal is to make sure you can make ends meet on the basics: housing, food, health care, insurance, and education. You can find information about budgeting and money management techniques online, at your public library, and in bookstores. Computer software programs can be useful tools for developing and maintaining a budget, balancing your checkbook, and creating plans to save money and pay down your debt.